Oprah's struggle to control her weight has been well-documented. The talk-show host has talked openly and frequently about her fluctuating size, proclaiming "Never again!" when she's fit and "How did this happen?" when she's not. But her most famous size-related moment occurred in 1988, when a downright skinny Oprah wheeled a wagon loaded with animal fat onto the show's set to represent the 67 lbs. she had shed in less than five months. To drop that much weight so quickly, Oprah said she ran 6.5 miles per day and consumed nothing but liquids. The episode, dubbed "Diet Dreams Come True," earned The Oprah Show its highest ratings ever. 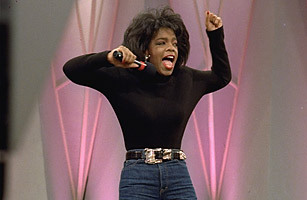 But within weeks of returning to solid foods, Oprah had gained back 10 lbs. By 1990, all of the weight was back, and in 1992 she reached her heaviest weight ever. "I thought I was cured," Oprah admitted to People in 1991. "And that's just not true. You have to find a way to live in the world with food."